It started out as just another ordinary working day for professional mover Jake Tan -- until he discovered a bag containing $50,000 cash inside. While some might experience a dilemma or even temptation when faced with such a large sum of money, Jake swiftly alerted his employer instead. 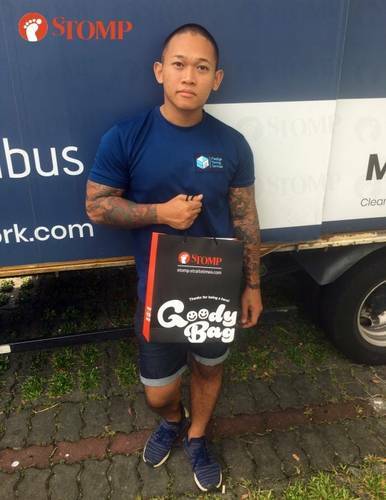 Jake, who has been working for Prestige Moving Services since June 2018, told Stomp that the incident occurred on Dec 1 last year. He and a team of around 10 colleagues were wrapping and moving furniture out of a family's landed apartment at around 4pm. The 23-year-old recounted in an interview with Stomp: "We were nearing the end of the move and as always, we double-checked the premises to see if anything had been left behind." When he went up to the third floor of the house, Jake saw a black plastic bag on top of a cabinet. "I took it down to see if the owner required us to move it for him or not," he said. Upon opening the seemingly nondescript bag, Jake was stunned to be greeted by stacks of $50, $100, and $1,000 notes. He shared: "I decided to inform my boss as I felt it was the right choice. "My boss returned the money to the owner's son, who was still in apartment at that time. His parents had already gone over to their new house. "The son said, 'Huh?! $50,000 like that anyhow put ah?'" On Tuesday (Jan 15), Stomp presented Jake with a Stomp Goody Bag for being a role model. The amicable young man also opened up about the stigma he faces in Singapore due to his 'pai kia' appearance and his past as an ex-convict. Each time you are honest and conduct yourself with honesty, a force will drive you towards greater success. Each time you lie, even with a little white lie, there are strong forces pushing you towards failure. Jake added: "What I think is that, what we choose to put on our bodies does not determine what our actions will be." Prestige Moving Services had also posted about Jake's heartwarming deed on its Facebook page. In the Jan 13 post which has since garnered over 3,200 likes, the company expressed its gratitude towards Jake and called him "one of our best men". "Honesty is very important in our industry where customers entrust their furniture and belongings to us," it wrote, adding that what Jake did was "the best move and decision". It also said: "Once again, thank you Jake for your honesty and we hope you will be with us for many many years more." When contacted by Stomp, a spokesperson for Prestige Moving Services said that instances of customers forgetting their valuables when moving house are not uncommon. The spokesperson added: "There have been things like iPads and expensive watches, but this is the most money we have ever come across. "We feel... very 'heng' (lucky). This could have led to a police case if not handled wisely and honestly. So I only have one word: Heng!"